If you’re old enough to remember CRT TV’s with the big bunny ear antennas, you’re likely to understand how easily radio signal strength can be affected by even a tiny move of the receptor. A similar principle applies to WiFi signals, and the above visualization drives the point straight home. It’s a 3D map of YouTuber CNLohr‘s WiFi signal in his home, albeit that of the relatively small area (360x360x180mm) within his CNC mill. See, to get this done he hooked up a ESP8266 WiFi module to his laptop, which gave him signal strength in real-time at 500Hz. He then mounted the module inside a large gantry-style cnc mill and took several long exposure shots, which he then composited in Voxeltastic, [CNLohr’s] own HTML5/WEBGL based render engine. The results can be seen above, and although it looks completely organic, it follows a pattern: “the signal strength increases and decreases in nodes and anti-nodes which correspond to the 12.4 cm wavelength of a WiFi signal.” And it also goes to show that if you’re having problems with reception, you might want to consider just moving your router a tiny bit before you start cursing it. Oh, the jokes to be had with this. Or more like, the cliché jokes to the tune of “what is this? A radio for ants?” Well, it is a fully functional radio that’s about the size of an ant, though we don’t expect the little insects from deriving any type of pleasure from it. Stanford engineer Amin Arbabian has managed to create a wireless radio just a few millimeters across that is so energy efficient that it doesn’t need a battery. 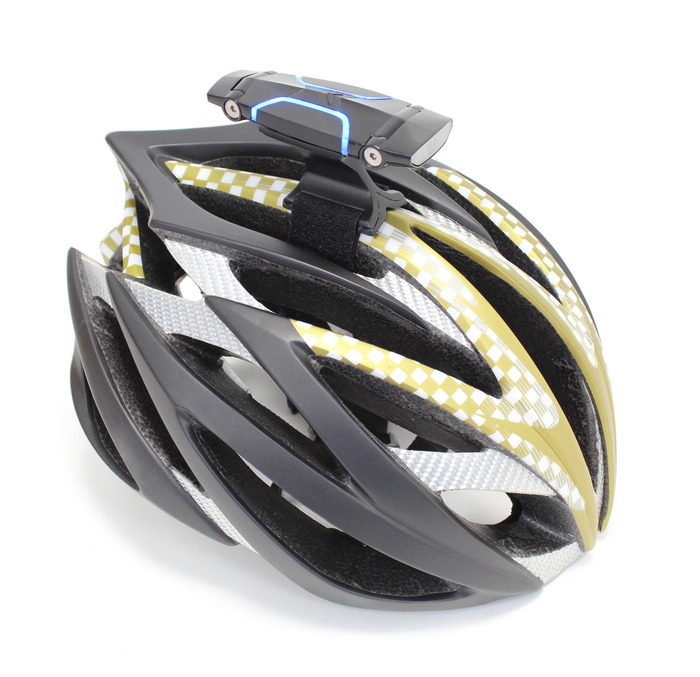 Instead, it harvests power from the incoming electromagnetic waves. 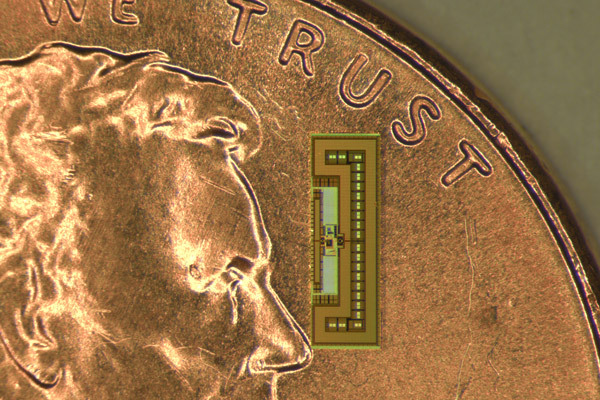 The Stanford radio chip is designed to compute, execute, and relay signals. What sets this technology apart is that it all happens on a single chip that doesn’t rely on any exotic materials or theoretical principles. The last time we covered a device that “harvests energy from the surrounding electromagnetic waves”, it was for the RCA Airnergy device, which purported to be able to charge its internal battery in this fashion. Back then the consensus was that this was impossible, or at least the energy gathered was so negligible that it would be impossible to charge anything with it. But this radio is different since it actually uses so little energy itself that a single AAA battery could power it for 100 years. Arbabian even managed to fabricate 100 of these tiny radios, just to see if they’d work, and they do. This technology could help facilitate the development of the “Internet Of Things”, where all your devices are interconnected and online, for added functionality. It’s all a proof-of-concept for the moment, but the fact that it can be done, and more importantly, done at a low cost, might signal a bright future for the technology. By David Ponce on 09/01/14 • Leave a comment! How is it possible that you got this powerful router, and yet this one bathroom on the second floor never gets any darn WiFi? 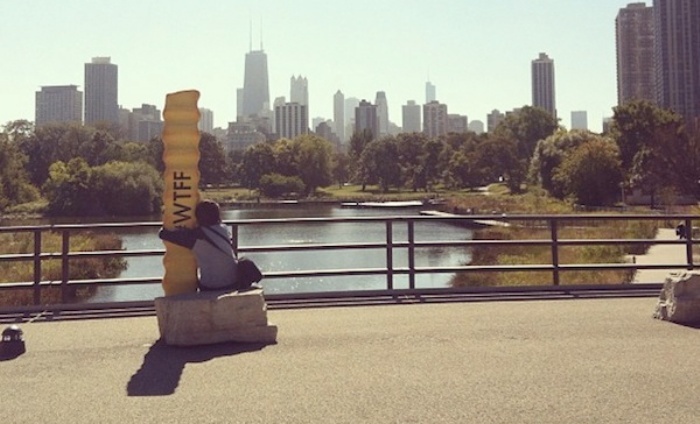 Jason Cole, a PhD student in physics wondered the same thing, but instead of cursing at his phone like most of us do, he decided to investigate. The picture above is the result of his efforts. After “mapping his own apartment and assigning refraction values to the walls, then applying so-called Hemholtz equations to model the electromagnetic waves’, he obtained a clearer view of what happens to the signal as the router is moved around. And while he did determine that the most optimal spot to place it was in the center of his apartment, he couldn’t do that, so he used his work to find the second best spot, one which would generate the most “tendrils” of coverage to the most places. While most of us don’t have the knowledge to find the optimal spot for our router, the image above does highlight the fact that moving things around even just a little bit can make a rather large difference and that after some trial and error, you may be able to improve your situation dramatically. By David Ponce on 10/10/13 • Leave a comment! Nest already has a thermostat on the market that’s being hailed as revolutionary. And it is, at least in the world of thermostats. Now the company is hoping to do the same with another, often neglected, household appliance: the smoke/CO2 detector. Nest Protect not only looks heaps better than a standard detector, but has so many features it puts them to shame. For one, it connects through Wifi to your home network, which allows you to configure each device to know which room its been installed in. This means that it not only alerts you when there’s smoke, but it tells you which room the smoke was detected in! 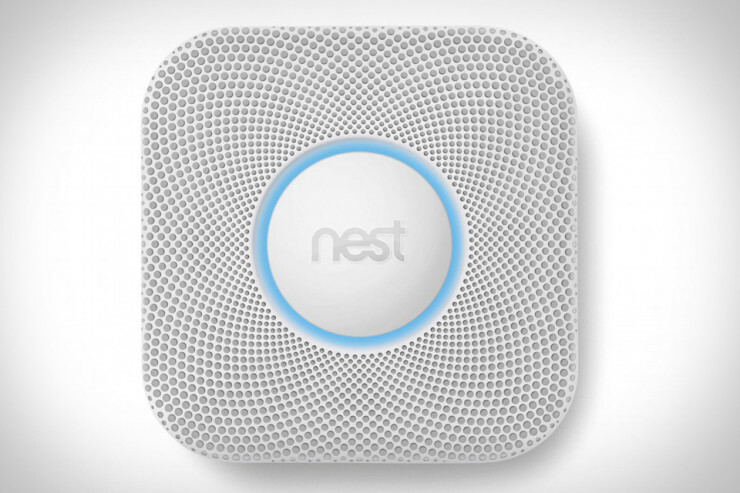 Also, if you’ve just burnt your grilled cheese sandwich but there’s no actual fire, Nest Protect will alert you that it’s detected smoke in a calm voice, before setting off an alarm; you’re then free to wave at it to inform it that it’s fine and nothing is on fire. That’s right, a simple wave of the hand avoids you having to get up on a stool to press the reset button as the alarm blasts in your ears. 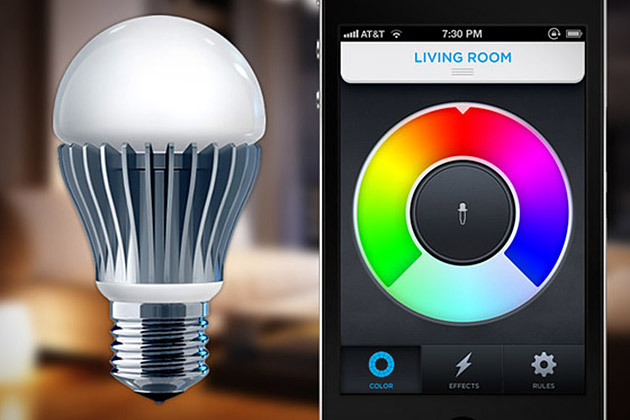 Finally, the Nest Protect can serve as a night light, lighting up to guide your path to the kitchen or bathroom in the dark as it detects your movement. But, in a nice touch of product design, it wont light up in the bedroom so you don’t wake up your partner. All in all, we’re really impressed with the Nest Protect, and at $129 we think it’s a steal. Available in November at Amazon, Apple, Best Buy and The Home Depot. 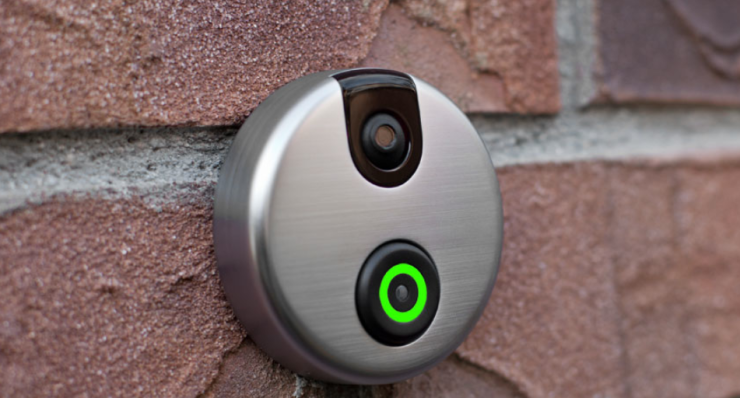 The iDoorCam wants to let you see who is seeking entry into your abode, even if you yourself aren’t on the premises. The rugged, waterproof doorbell features a camera, a mic, speakers and of course, a WiFi module. With that gear, it simply gets online and allows you to access the system via smartphone, wherever you are. When someone rings the bell, you get a notification on your phone and you can have a two-way conversation with the person, as well as enjoy the ability to see them. It doesn’t look like it has the ability to actually unlock your door from a distance, so it wouldn’t work if, say, the kids forgot their keys and you want to let them in. That could be something cool to add in future versions, but for now, $165 will get you yours, with an October delivery. 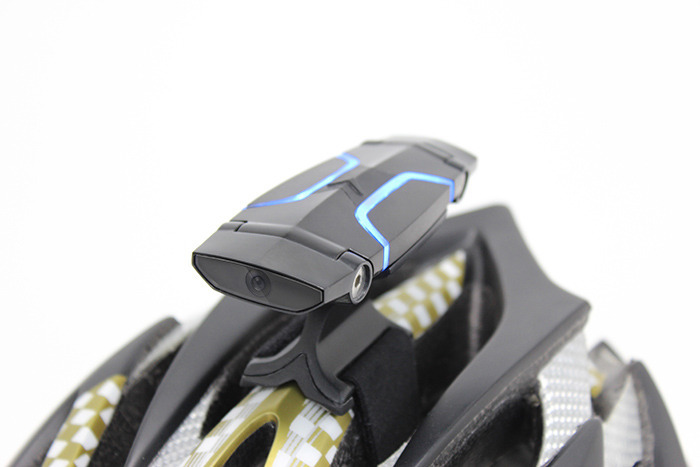 The company will start accepting pre-orders soon. Oh, and it looks like it’s iOS only. By David Ponce on 12/06/12 • Leave a comment! Unlike the joke Crib Dribbler from yesterday, the Pintofeed is a real product that we’d actually like to purchase. 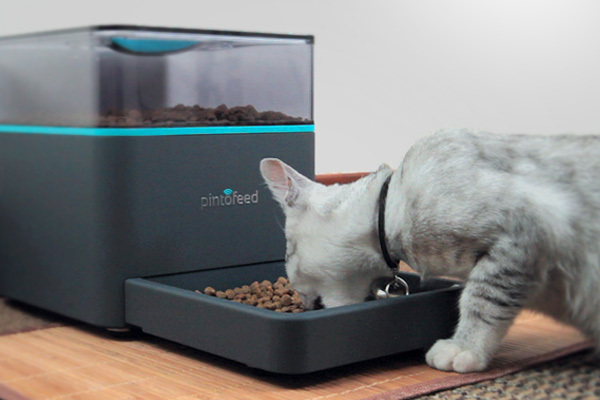 It’s a WiFi-connected mechanical pet-feeding device. Once setup, you simply load up the 5lbs or 10lbs compartment with dry food pellets and at the press of a button from your smartphone, serve up a 1/8 cup portion of feed to your loved house companion. Over time, the application will learn your pet’s feeding habits and create an automated feeding schedule. You can even use this information to slowly trim his food intake if you’ve noticed your pet has been packing on a little too much fat. There are a number of fail-safe features that make the Pintofeed reassuring to own. For instance, you will be notified every time your pet is fed, and if food jams the mechanism, you’ll also get an alert. There are two motors, should one of them fail, and there’s a battery that lasts three months in case the power goes out. Considering how many products in your home are getting a connectivity upgrade, it’s about time that the lowly pet feeder got the same treatment. Currently, Pintofeed is in the fundraising phase on IndieGogo, and a $99 pledge will secure a June 2013 delivery.